This is a place that add the all other drivers that we find it later. 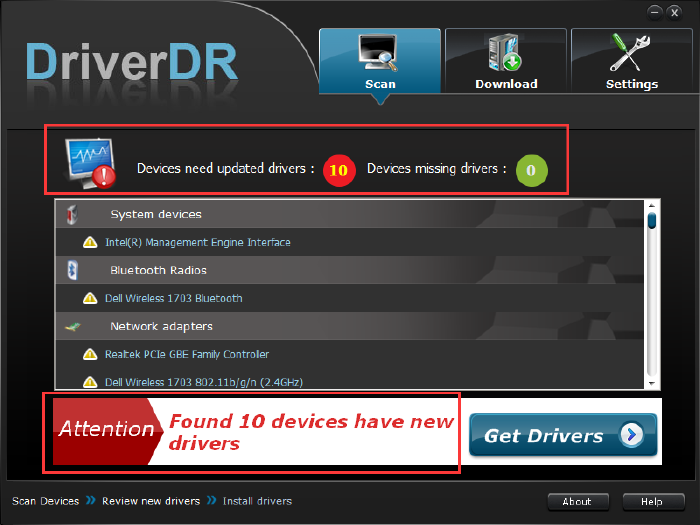 So you can find all the drivers from Driverdr. Have you ever encounter problems such as not working Bluetooth, Bluetooth missing and no drivers to be found for peripheral devices when you are trying to upgrade your system from Windows 7 or 8 to Windows 10? These are the reminders that are telling you that you need to upgrade your latest Bluetooth drivers and keep them updated with your current system such as Windows 10. 1. When you upgrade the system, the new system file may not contained the drivers that are right for your new system. Since there is a time difference between the release of the new system and the release of the drivers, not to mention drivers for device such as Bluetooth, which is not a mainstream device and Microsoft may be even put it in the system fie. 2. If your Bluetooth driver is supported by Windows 7 and Windows 8, then you will find it working just fine when you upgrade your system from Windows 7 to Windows 8. But when you try to upgrade your system from Windows 8 to Windows 10, you will find your Bluetooth not working since the Bluetooth drivers might not be supported by Windows 10. Therefore, you will need to update your Windows 10 Bluetooth drivers. We know that to use your Bluetooth peripheral devices, first you need a Bluetooth driver to help your Bluetooth adapter connect to your computer. This is quite a normal problem on Windows 10 system which can also be fixed quite easily. In addition, you can solve all the Windows 10 update drivers problem at a time. This could count as an automatic solution for your Bluetooth drivers on Windows 10. Fix it with Driver DR(Short for Driver Doctor). Use Driver Dr to scan your computer to see if the Bluetooth drivers are out of date, incompatible missing or there are some errors with them. Moreover, after the update or upgrade of your system, it can also help solve your problems as follows. Please refer to the following guide step by step. This should be easy and efficient. Step 1: Download and install this Bluetooth Drivers Updater on your computer. Step 2: Run the “scan” function to allow the product to scan drivers on your computer. Step 3: After the scan, recommended Bluetooth drivers for Windows 10 system will be shown on the interface. Click “download” to download and then update the needed driver(s). After this, you can try transfer files, movies, photos from and to your computer and devices. Way 2: Reset the Bluetooth device. If you cannot find Bluetooth device, you can try to remove it and then connect it again. 1. Go to Start button, and click “Settings” and enter “Devices” to enter the devices list. 2. Choose devices that are not working and click “Remove Device”. 3. Click “Add a Bluetooth” and it will refresh the computer, press the reset button on the device. 4. Select “My device is set up and ready to be found” box and next. 5. When the Bluetooth device is found, select it, click “Next” and follow the rest of the wizard. Note: Problem might not be solved every time you try this method. The system requires a further check of the “Device Manager” after it automatically install the Bluetooth. If an exclamation mark appears on the Bluetooth Adapter, that means you are having an incompatible problem, which means that you are going back to Way 1 to get your problem fixed. If your Bluetooth adapter is incompatible with the new system, try to use Microsoft to update drivers for you device automatically. Single click on “Bluetooth peripheral device”, press the right key, choose “Properties”. Then choose “Driver”. Choose “Update Driver”, then enter Microsoft automatically search for update driver software function. And the system will automatically help to search online the driver you need and then download it. This method requires that your Internet connection is working just fine, otherwise, you will not be able to have access to the download page. Apart from that, only some but not all of the drivers’ incompatible problem can be solved. If your problem with your Bluetooth driver still persists, please go back to Way 1 and have a try of our product Driver Doctor. You will need another tool to help you in this way. Bluetooth Driver Installer is a free Bluetooth drivers download and update software. You can download it from here: Bluetooth Driver Installer. Tips: Because this software is a simple freeware, and it is not create system restore point, so you need to manually create system restore. There are mainly for reasons causing problem like this. 1. Your graphic or display driver is an old version. This notification is a reminder for you to download the latest version of graphic drivers from AMD, ATI and NAVIDIA etc. 2. There are too many programs running on the background, especially programs such as videos and games, which could be the major reason for your slow PC. 3. The GPU is taking more time than permitted to display graphics on your monitor. 4. There are some packages in your system that needs to update. There could be more reasons than the above ones. For example, your graphic card could be too old to process a big amount of images at a time or that the BIOS or chipset driver for your motherboard could be outdated. Notice: From the AMD, NVIDIA and Microsoft official documents you can only find this problem solutions for Windows Vista and Windows 7, but if your system is Windows 8 and Windows 10, you can also follow this way, it works. But if you are Windows XP users, this error will not happen. Most of the time, this problem will go away if you update your graphic or display card driver to the latest version. This should also be the first thing you consider when you meet this problem. This is also the easiest way to fix the problem. Use Driver DR to help you download and install the driver that is needed for your computer. Manufacturers such as NVIDIA, AMD, Intel and so on can all be found in our well-founded database. When the download is complete, please install as instructed. Then double click it to run it on your computer. 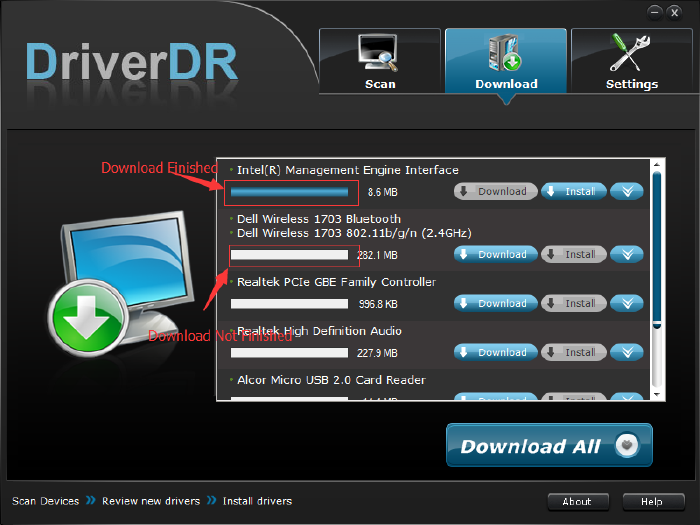 Here is how you could use Driver DR to help you with the download and install of the needed driver in details. Click “Scan Now” button. Then wait for a few minutes for the scan to finish. This is what you will see after the scan. Click “Get Drivers” button to choose the drivers you want to update. You could choose to download the drivers one by one or download all the drivers to save you time by clicking “Download All”. Step 3: Install drivers update. Click “Install” button after the download is finished. Then just leave it to Driver DR, who will help you with the rest of installation. You can see another article here about how to update graphic drivers. You can go to “Task Manager” to terminate some programs working on the background, especially programs such as video program or gaming process. This will help to release stress for your GPU. You could start “Task Manager” by single clicking taskbar and then right click “Start Task Manager”. As mentioned above, the default setting of the response time of Timeout Detection and Recovery could be one of the causes. The default setting is 2 seconds, so if you set it higher than 2, the problem will be solved. Step 1: Close all the programs based Windows. Step 2: Open Registry Editor. Press the “Start” button on your keyboard. 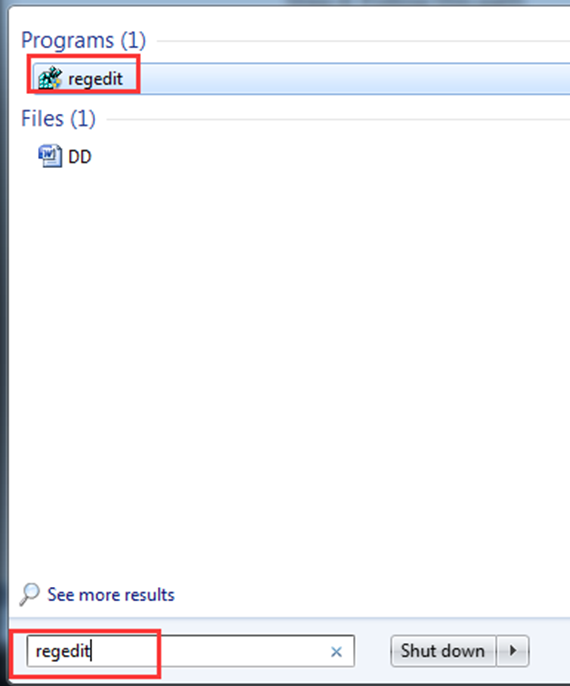 Type in “regedit” in the box and then press “Enter”. Then choose “Yes”. Step 3: Follow the path “HKEY_LOCAL_MACHINE\SYSTEM\CurrentControlSet\Control\GraphicsDrivers” to enter GraphicDriver Settings. Step 4: Delete the old Tdr Delay file. Find the “TdrDelay” file on the bottom. Right click it, choose the third option to delete it. Step 5: Create a new TdrDelay file. Right click on the blank space and choose “New”. Choose the right option accordingly(32-bit or 64-bit). Then, rename the file as “TdrDelay”. Step 6: Set the Value Data. Right click “TdrDelay” and choose “Modify” to enter Edit Value Interface. Type in a number above 2, say 8, then set the new created file default value as Zero. As you can see for yourself, this is far more complicated and it might even cause some unwanted problem. Sometimes you need to update your operating system, whether by using the automatic update of Microsoft, using a third party program or find the drivers on the official websites by yourself. If your GPU is overclocked, it is suggested that you set it to below standard or the same as standard. There are many GPU overclocking utilities, such as AMD OverDrive, Gainward Expertool, Sappire Trixx, Zotac Firestorm, Asus GPU Tweak, EVGA Precision, and the King tool MSI Afterburner. 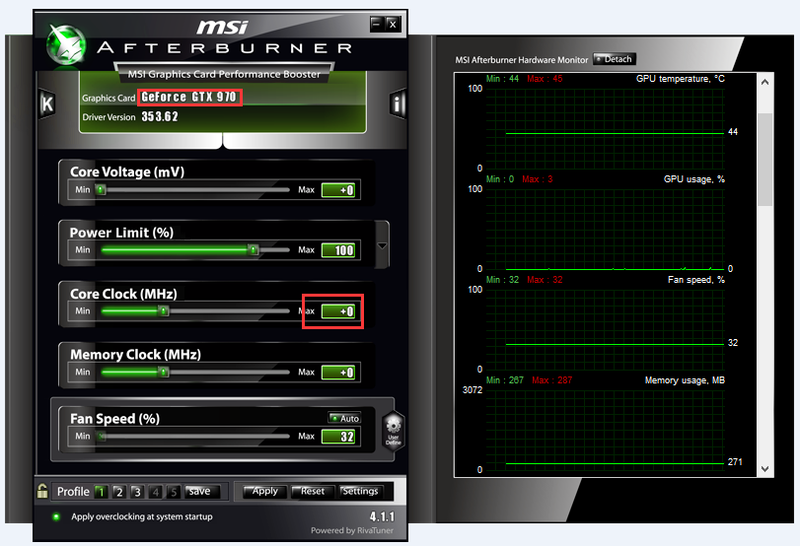 MSI Afterburner is the most popular GPU overclocking utility around the world. It supports almost all the latest version of NVIDIA and AMD graphic card. Users can reset the list things such as: fan speed, core GPU clock’s, shader clock, etc. There are five things you need to reset. And for reset the GPU frequency, you can try to reset the Core Clock database, decrease this database or save it as default. GPU, short for Graphics Processing Unit, is a concept relative to the CPU, because as modern computer (especially the household system, game enthusiasts) graphics processing becomes more and more important, they need a dedicated graphics core processor. GPU, equivalent to the role of the CPU in a computer, is the “heart” of graphic card. It determines the class and most of the performance of the graphics card. It is also the main difference between 2D display card and 3D display card. When dealing with 3D graphics and special effects, 2D display chip mainly depends on the CPU processing power, which is known as “soft acceleration”, whilst 3D display chip is integrated the three-dimensional image and the special effects in the centralized processing functions in the display chip, known as “hardware acceleration” function. Display chip is usually the largest chip on the display card. So the emergence of GPU and GPU improved technology have strengthened the ability of independent processing graphics image of display card. And the overclocking technology further enhances users experience when they are playing games. If your problem still persists after the update of your graphic drivers, you can try to update the motherboard drivers, since almost all the hardware is related to the motherboard(which applies most to old computers). Hence you need to check if the drivers for the motherboard are outdated, if yes, please find out the latest versions and update them. It usually seen on system before Windows 7. Place your hand on your computer, if you find it too hot, try to turn it off and wait for it to cool down to a normal temperature then turn it on again. If you are using a laptop, you can use the radiator to help you cool down your computer when you are playing games or entertaining yourself in other ways. The second thing for you to do is to clean the dust off of your graphic card and computer. If you are using a desktop, just open the main box to check and clean the fan that was built within. As for laptop users, a radiator prepared beforehand is necessary since different manufacturers might require different ways of cleaning. When the graphic card is too old to be fully compatible with new games or to process lots of images at a time, you might need to consider change it for a new one. Plus, old graphic cards might not support the newly released games as games will be updated at a rather fast speed and therefore require higher configuration graphic support. To find out the reason why, you need to know what is TDR first. 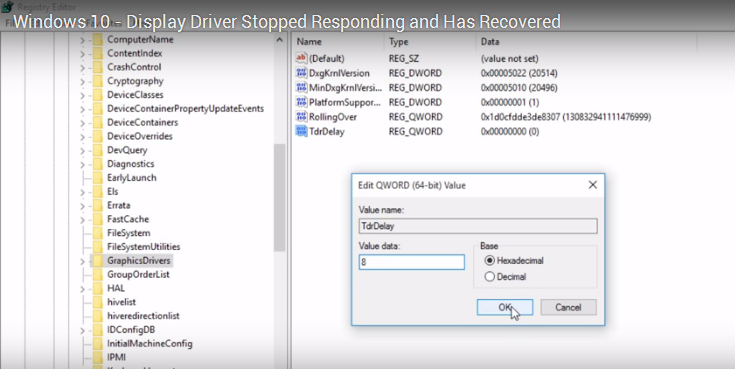 TDR, stands for Timeout Detection and Recovery, is a feature of Microsoft system which was created to detect the graphic card respond to problem in your system. If Windows system does not receive a response within two seconds, the system will reset the graphic card so as to keep the monitor run smoothly. If your graphic card cannot be set as normal, your computer will likely to be locked up, sometimes there might even be a blue screen or death problem. So “Display Driver Stopped Responding and Has Recovered” shows up to inform you that TDR runs normally in your system and it is resetting your graphic card. TDR only exists in operating system that is above Windows Vista, so you cannot see it on Windows XXP but on Windows 7, Windows 8 , and Windows 10. Summary: Driver Doctor can solve the “Display Driver Stopped Responding and Has Recovered” problem easily with only three steps. If this problem has occurred more than once, it is quite necessary for you to learn how to solve it. The standard VGA graphics adapter shows exclamation on “Device Manager”. It shows “This device cannot start (Code10)” after right click “Standard VGA Graphics Adapter”. Tips: Sometimes, you will find because of the Standard VGA Adapter not installed success (it shows exclamation), your display not shows as normal. First, I need to tell you, for this question, what you need do is not find and download standard vga graphic adapter drivers, it will not solve your problem. You need download and update your graphic card driver. After you download and update the graphic drivers for your system such as Windows 7, the exclamation will disappear or all the “Standard VGA Graphics Adapter” will disappear, it only shows your graphic card. After you know why this happened, you can solve this problems easily. We know that for your computer graphic card, it will shows as two status: one is main graphic driver, this driver will be perfect enhanced the performance for this hardware, and is what we need; the other one is standard vga graphic adapter driver, this is make sure your computer graphic card can basically view in case of main graphic driver missing, but the effect of display will be not normal, it shows the basic effect for the graphic card. So what you need do is install the graphic drivers for your desktop and laptop. When you installed it correctly, the standard VGA graphics adapter yellow exclamation will disappear. In a word is your graphic driver is not installed correctly or it is missing, the display only show the basic image effect. We know when you upgrade your system, such as from Windows Vista 64 bit to Windows 7 64 bit, the system file include the mainstream drivers, but not for all and for every model computer. So after you upgrade it, some drivers are outdated, missing, or not compatible with new system. Another situation is graphics card not installed correctly. Make sure it is installed correctly. (I am not say more about this situation, because this is not related to this content). Why it called Standard VGA Graphic Adpater? This is named by Microsoft. In device manager, every hardware is must be called a name. When your graphic driver is missing or error, but the system know there has a graphic card, it named this card as standard VGA graphic adpater. Synaptics touchpad is a standard configuration of a laptop. Here will use the Dell Vostro 5470 as an example to shows how to download and install synaptics touchpad drivers for Vostro 5470 Windows 7 operate system. Step 1: Use Google Search to enter the Dell official drivers download center. Enter the word “Dell Vostro 5470 drivers”. After click the link, you will enter the product support page about Dell Vostro 5470. Step 2: Follow the 3 arrows to find the Dell Touchpad driver file. On this page, Dell will identify your computer system automatically, this image show the system is Windows 7 64 bit. I think this is cool. It saved more time for choose list items. Follow these 3 arrows and check it. If it is “Drivers & downloads”? If Dell automatically check system checked and shows you system as “Windows 7, 64-bit”? If you choose the “Mouse, Keyboard & Input Devices”? The touchpad belongs to the Input Devices category. So after you choose it, the driver for synaptics touchpad will list below. Step 3: Download the synaptics touchpad driver file. This image shows the file Input_Driver_W92DR_WN32_15.3.1.1_A04.EXE is the Dell Vostro 5470 Touchpad Driver. Here you can find the detail information such as size, release data and last update data, version, etc. Click “Download File”, it will start download the file for you. Here is the directly download link: http://downloads.dell.com/FOLDER03187382M/1/Input_Driver_W92DR_WN32_15.3.1.1_A04.EXE, if you do not want to find it again, you can directly download from here. And Dell makes thing more effective, after the download finished, it will automatically install. So you have finished update the touchpad drivers for Dell Vostro 5470. If you do not want to do on the official site or want to view the driver list, you can see it from here: Dell Vostro 5470 drivers list. This contains applications, audio, chipset, input, network, security, serial ATA, video etc drivers. If you think this way is a little complex, and you may have more drivers want to find because of you upgraded the hardware for your computer. So you try to use Driver Doctor. It can helps to identify all of your computer hardware (sometimes, the windows system cannot identify all of the hardware for your computer, this is a normal phenomenon). After download and install this software, it can automatically scan your computer, and then told you the missing drivers, outdated drivers, and then it will helps you to automatically download and update for you. Part 1: What is PCI Simple Communications Controller? PCI Simple Communications Controller is an AMT device. For Computer, the AMT device is normally called Intel AMT. The full name of Intel AMT is Intel Active Management Technology, It is essentially an integrated chipset embedded systems, does not rely on a specific operating system, which is the biggest difference between IAMT and the remote control software. This technology allows IT managers to remotely manage and repair networked computer systems, and the implementation process is completely transparent for clients, thus saving users’ time and computer maintenance costs. In short, missing PCI Simple Communications Controller driver on Windows 7, 8 and Windows 10, you need to find Intel AMT Management Engine Interface file. AMT device driver called AMT Management Engine Interface(MEI). So whatever the Windows 7, 8 and windows 10, all of the questions about “PCI Simple Communications Controller driver missing” are related to the AMT Management Engine Interface file. Find and download the related Intel Management Engine Interface(MEI) driver and install to solve the problem. This is an example to explain when “PCI Simple Communications Controller Unsuccessfully installed on Device Manager / Computer Management” happens. How to Install PCI Simple Communications Controller drivers for Windows 7 for Acer Aspire 4741G? This image shows Acer Aspire 4741G missing the PCI Simple Communications Controller drivers. And this hardware ids value is PCI\VEN_8086&DEV_3B64&SUBSYS_03701025&REV_06. After check, this is Intel Management Engine Interface (MEI). Yes, it is what we said before. HM55 is Intel 5-series chipset. So the PCI Simple Communications Controller drivers’ problem is solved for Acer Aspire 4741G Notebook. In this way, you can solve the problem about this type problem, what you need do is find the Management Engine Driver for Intel 4-Series Chipset, Management Engine Driver for Intel 6-Series Chipset etc. In this way, may take you some time, but you will solve PCI Simple Communications Controller driver problem on Windows 7, 8 and Windows 10 finally. Also you can try to use Driver Doctor to help you automatically find the missing PCI Simple Communications Controller driver for Acer, HP, Lenovo, Dell, ASUS and other Laptops/Desktops. What you need do is after run this program, click “Scan Now” button to scan your driver information, and it will shows you all the missing drivers(including PCI Communications Controller) and outdated drivers for your System (Windows XP, Vista, 7, 8, 10). You can choose only download PCI Communications Controller driver, or you can “Download All“. If you want to know the step by step guide of how to download PCI Simple Communications Controller driver, you can view from here.